Well another holiday over, they go far too fast for my liking. Sorry I didn't blog last night, but I was so busy cleaning and polishing TQ, I didn't finish 'till after dark and was too exhausted to get the laptop out. The paint work on TQ had become very oxidised and had a dull finish, so I used T Cut to remove the oxide and then polished with Craftmaster Wax. Now she shines beautifully. I'm sure the next shareholders to holiday aboard will appreciate it, and its set ready for the onslaught of winter. 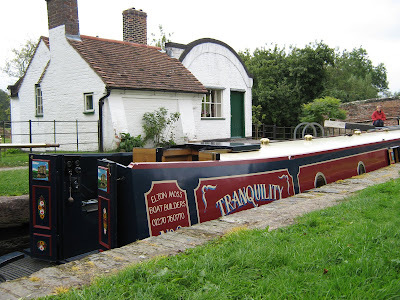 We moored just South of the M42 Motorway bridge and it was surprisingly quiet in the night, just the odd vehicle going by, and the sound deadening bridge sides helped to muffle it considerably. 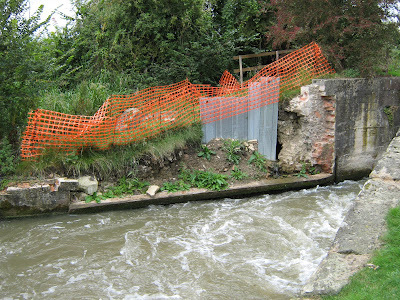 About time this was repaired, look at the weeds growing in it. That piling is not a permanant solution. This is Lengthman's Cottage, a Landmark Trust building. Probably has one of the best extensions. 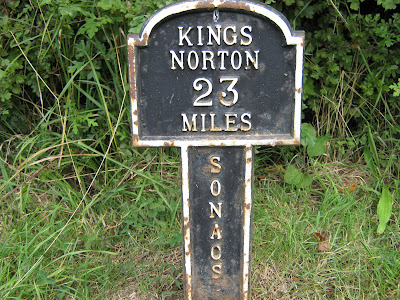 Typical milestone along the Stratford. That bizzarre bit on the side at Preston Bagot. 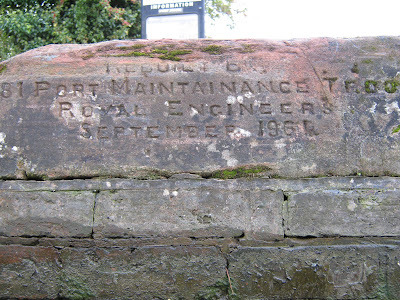 An inscribed lock coping stone. Two days worth, and I get shot at! This on looks better, but you can't see the new extension behind. ...but this takes the biscuit! Lapworth Bottom Lock No.27. I know where I'd rather be. Friday, and its full steam ahead to get as far as possible so we have plenty of time to clean TQ before we leave on Sunday. 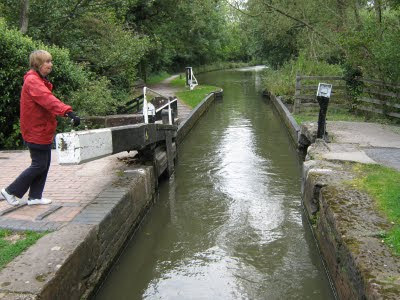 We made good headway up the Lapworth Flight and at Kingswood Junction I was walking back from preparing lock 19 when there was a hissing sound went rapidly over the top of my head and crashed through the trees. It was the unmistakable sound of an air rifle. I reported it to the BW man at the scene and he did a walk round the area but found nothing. A bit later Lin heard the same thing. Whoever it is they'll get caught. Made it to lock 14 and couldn't resist going in The Boot for lunch. And the weather was so good we opted for lunch in the garden. It was wonderful. Onward, and we had the rest of the flight to do and we are now moored just outside Hockley Heath between bridges 24 and 23. A lovely quiet spot and good telly and 3g connection. We've done our last lock today, and there's one last lifting bridge tomorrow, an electric one, so much easier. 30 Locks and 2 lift bridges. Phew! Slipped the piling hooks at 09:40hrs and headed off down the last five locks to Bancroft Basin. 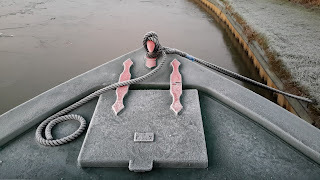 We intended to start later this morning to give time to those leaving the Basin to vacate the premises and make their way up the locks leaving them in our favour. We moored just a few yards outside the Basin and walked under the bridge to see the state of play. There were plenty of spaces but we didn't fancy mooring side by side on the pontoons, so we decided to stay put. Its a relatively quiet spot so we're happy. The Basin and surrounding area has become very commercialised with ice cream sellers, burger bars, river trips and floating restaurants - shame. We made enquiries about a temporary licence to take TQ onto the River Avon, not that we have time, but it would be interesting to know. 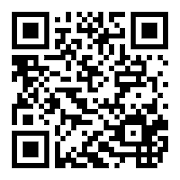 £35.00 for the Upper Avon (valid for 15 days) and £55.00 for both Upper and Lower Avon (also valid for 15 days). Not today thank you! Had lunch in the Dirty Duck. This is a quaint olde worlde pub often frequented by thesbians from the Royal Shakespeare Company. Didn't see anyone famous today, though. I had a cheese ploughmans and Lin had a ham, and we swapped half the cheese and ham to have half each, if you see what I mean. The wide beam in the distance is a restaurant boat. The blue and white boat on the far side is an ice cream sales boat. Tomorrow morning we head into the Basin to wind and then make our way back up the Stratford. Not sure where the next stop will be yet. Well, I was hoping to start writing up this last Sunday evening, but there was no signal from where we were moored. No 3G, no mobile phone signal on mine or Lins, and no telly. Not even a glimmer. 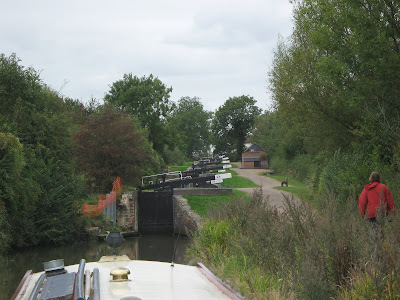 Anyway, Sunday we left Alvechurch at around 11:45hrs and made our way North through Wast Hill Tunnel which, incidentally was the slowest journey we've ever made following another boat. We were on tick over and kept catching up with the boat in front, and having to stop to let him go on a bit. At Kings Norton Junction we turned right onto the Stratford upon Avon Canal and left the slowcoach to go on his way to birmingham. The rest of the days journey was eventless, oh, apart from a couple of egits who found it most amusing to spit at us as we exited Brandwood Tunnel. Could have been worse, could have been bricks! We didn't fancy mooring any where along this stretch and it wasn't for at least five miles before mooring became a possibility. We found a spot just past the Blue Bell Cider House at Illshaw Heath, in a bit of a cutting covered with trees, very peaceful. 1 lock. If you can call it a lock. 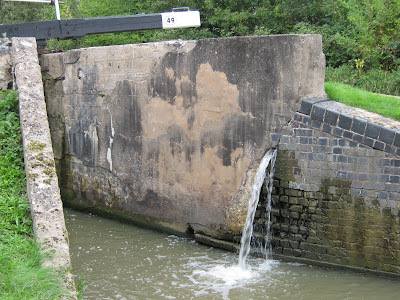 It used to be a lock which separated the two canal companies. Both gates are left open so its straight through now. The next morning we were up early, well early for Lin, and by 08:00hrs were on our way again. 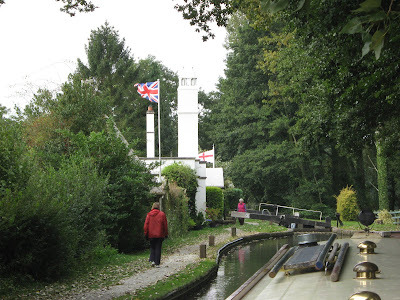 Soon we came to the Top Lock at Lapworth and began our decent, stopping off at the Boot Inn for lunch. well, it would be rude not to. As it was lunch time and we had a million locks to do we thought it best to only have something light so we opted for a ploughmans each. It was too much really, it came on a huge wooden platter with ham and two cheeses, and all the other stuff. Very nice, though. Onward, and we had to force ourselves to get going in the afternoon, so we went straight on at Kingswood Junction after taking on water, and finished the day between bridge 40 and the Fleur de Lys. 29 locks, 2 lift bridges. The weather has been good so far, but today has been quite windy although it's not effected us too badly. We're now moored just below lock 50 for the night ready for the five locks down to Bancroft Basin tomorrow.